The Ask is your personal manual for building the best, most fulfilling personal and professional life possible. Crafting the perfect ask can fund your new business, support your favorite charity, and get more quality time with your significant other—but it can do so much more than that. It can change your life. In learning how to ask for what you really want and deserve, you lose your fear of rejection and judgement. You create the greatest sense of self-worth that no one can give you, you give it to yourself when you ask. The critical moment is when you turn your skills inward and make the hardest asks, the ones you ask yourself. This book is designed to make you an Exceptional Asker, and in the process, give you the confidence and skills you need to achieve all your goals and realize your dreams. You'll learn how to prepare, what words to use, what to avoid, and how to follow up, and you'll purge the natural hesitancy that has been holding you back for so long. Asking is about empowerment. It shows the world that what you want matters. It defines who you are, where you're going, and who will be by your side. This book provides over 175 sample asks, with clear actionable steps to help you claim your space in relationships, at work, and in the world. Mastering the art of the ask reconfigures your approach to life, and changes the way you tackle challenges and goals. The Ask gives you the skills—and the mindset—you need to accomplish anything you can dream. 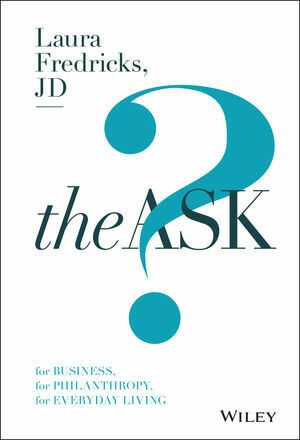 LAURA FREDRICKS, JD, is the founder and CEO of The ASK©. An attorney-turned- philanthropic advisor, she created her own class of personal empowerment with The ASK© approach to philanthropy, business, and life. A world-renowned fundraiser, consultant, educator, and speaker, she is the bestselling author of five books, including Money Wellness: Is Money Making You $ick?, and Winning Words for Raising Money.